While exploring social monitoring software last week, I ran across Sprout Social – a ‘new’ entrant (at least to me) in this fast-and-everchanging space. Since Sprout Social has a free 30-day (no credit card required) trial, I decided to give it a go. I have been a user of Hootsuite personal and corporate accounts over the past several years, and I will use that as my competitive benchmark. Listening is key to social media — Since listening is the first step in any social media strategy, finding a tool that you like (and can afford) is critical to be efficient in this process. Sprout Social pricing — Sprout offers two plans – Pro and Business. The Pro plan costs $9 per month and includes the ability to track 5 identities (Twitter, Facebook Personal, Facebook Fan, Google Analytics and LinkedIn accounts). The Business plan costs $49 per month and lets users monitor 10 identities and adds support for location based social media leaders Foursquare and Gowalla. Other Sprout Social features — in addition to the listening and analytics feature, Sprout Social also helps users manage the interactions with their followers and has some neat features to find new followers. 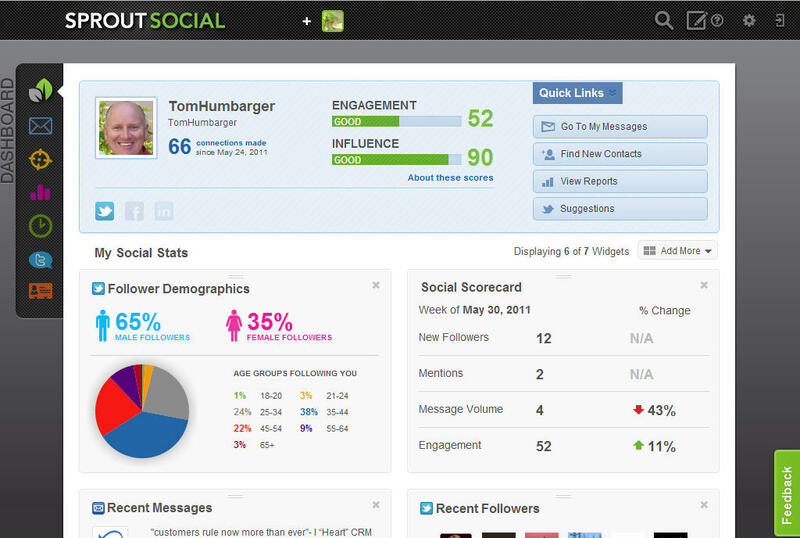 The Business version lets users follow a team-based approach to managing social media interactions. Like Hootsuite, there is also a feature to schedule tweets and other interactions. Lastly, there is a Social CRM feature that will let you track all communications with customers who you set up as contacts in Sprout Social. For another take on Sprout Social, check out the WebApps.tv video review of Sprout Social from last week – they gave it a 9/10 rating. While I am not recommending Sprout Social (yet), I do recommend giving it a try and seeing what it will do for you or your business. This blog post is an experiment on creating a blog post from my weekly Twitter Tweets posted @tomhumbarger.